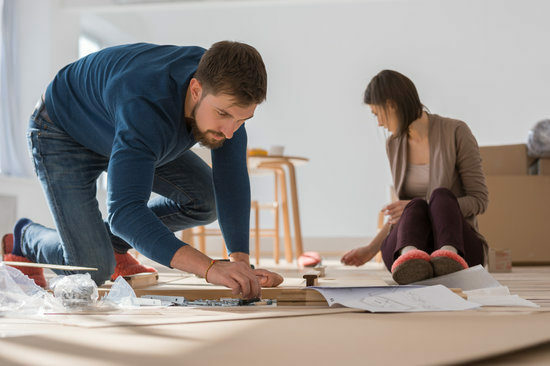 Here at Express Removals 24/7, we have all of the experience and tools which produce our furniture dismantling and assembly service an effective one. The moment our elimination staff arrives in the door, they are going to have the tools together prepared to handle whatever furniture you've got. Typically, client's request us to dismantle their beds and sofas. These are things which we are able to manage easily, and our resident experts will have the ability to take them apart fast and then put them in a flash in their new home. Need movers to move in to new house with sofa and boxes? You might have some level pack furniture you'd constructed which you can't replace in your site. When it is a wardrobe, bunk bed, couch or a wall fitting, which is our job, we supply the support of dismantling furniture for transport and reassembling the furniture in your new address. Our team will build your furniture that is packed at a procured and cautious manner which will make sure your things are to work with. Our man and van engineers may also dismantle your furniture, disconnect your kitchen appliances and electronic equipment, to package suitably prepared to relocate. Not only will we organize your relocation for you, but we'll also deliver at a suitable time for you in an equally organized manner, unloading your possessions at the specified rooms, unpacking, building your furniture and cause you to feel assured and comfortable to enjoy your new residence. We talk and comprehend guides, maps, and directions and sense the pain of losing our cherished furniture to unprofessional movers and packers, we'll dismantle your things, map their components and the positioning of the components and package fittings carefully and carefully to prevent crucial components becoming damaged or lost. We'll spare you the trouble of replacing your furniture that is beloved. Would you need assembly or disassembly of furniture? Young couple putting together self assembly furniture as they move into their new house. It's necessary to disassemble a couple of components of furniture to move them nicely and economically? To lessen the probability of damage? Would you not feel comfortable doing this yourself? Perhaps we can assist you! Home Furniture dismantle and assemble types of furniture such as beds and dining room. Garden Furniture we can provide to dismantle and build backyard types of furniture such as trampolines, climbing frames, and outdoor dining room. Office Furniture in case you've just moved into a new workplace, and you've determined you want new furniture, then we could build this for your benefit check out our office furniture movers firm. Oftentimes, elimination of larger portions of furniture is essential to reduce harm. Thinking specifically of those vulnerable parts like attachment points and screw holes. Apparently, stable furniture is frequently too brittle too to transfer without disassembly. Our moving adviser can advise you through a private visit or predicated on great photographs whether specific parts of furniture should be taken apart entirely or partly. Before beginning the disassembly, you need to ensure whether this may be carried out by a lot of individuals. Additionally, regarding big wardrobe systems, it's very important to use a particular program to prevent harm to the cupboard and to prevent you from getting hurt. This is essential to indicate the elements in this manner they can be reassembled in a suitable order and in the ideal place in the destination. Using a camera can at times be helpful with this. The access to the initial instructions may be deemed necessary. Are you really not excited about the hassle that this brings? Then our man and van experts can give you service. Disassembling, and afterward reassembling, of furniture is regular for our movers. We do it fast, professionally and with no damage to your furniture. Experience and expertise in this region must avoid the furniture out of not being constructed properly in the destination. Not certain how to have your sofa from your living space? Need to eliminate a mattress or apparel that was constructed within the area? If you are moving large furniture items, you are going to want our furniture dismantling service. Quick, dependable and professional, our home and office removals team provides excellent support and excellent results: ask your free removal quote today. COMPLETE FORM TO GET COST FOR MOVING!